We’ve all heard the idea that boys potty train later than girls. While it’s true that on average girls tend to complete potty training about three months earlier than boys, it doesn’t mean that your little boy is destined to have more of a struggle. Be prepared to create the best possible environment for your boy to successfully use the potty. Here is a tip from Pull-Ups® partner and child development expert Dr. Heather Wittenberg for potty training your boy. Teach boys to use the potty sitting down. Standing up and aiming into that toilet is a skill that can come later. Help your little guy make potty progress by showing him how to pee sitting down — unless you’re willing to mop up the bathroom a few times a day, that is! Junior takes his cues from you, and eventually you can show him how the big guys do it. In addition to those expert tips, here are three more parent-tested tips that can help you potty train your little boy. 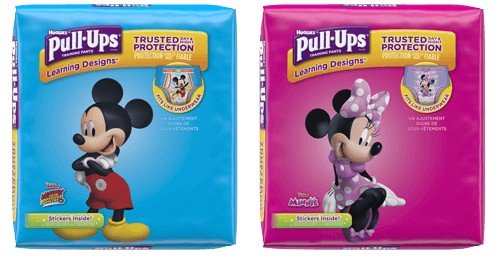 Make sure to stock up on Pull-Ups® Training Pants with their favorite characters and purchase underpants with your son’s favorite characters on them as well. Taking a quick trip to the store with your son and letting him pick out them out will make him feel extra excited to make the transition. Let him decorate his potty with stickers. Giving your son the chance to personalize his potty is a fun activity that can make him take ownership of the training experience. If your bathroom is far from his play area, consider getting another potty that you can keep nearby. The closer your son is to the potty when he feels the need to go, the more likely he is to make it. Create a reward chart that works for your son. You know best which rewards appeal to your child – stickers, small treats, video time, or a coveted toy. Make sure to have a small reward ready for your child, such as placing a sticker on the chart, every time they go. Potty training can be a stressful experience, but with the right tips and tools, you and your little boy will be on your way to potty success. Make the journey fun and be sure to celebrate every success. Before you know it, he’ll be potty trained and on the next big milestone!